Colombia's President-elect Ivan Duque celebrates his victory in the presidential runoff election, in Bogota, Colombia, Sunday. Duque defeated Gustavo Petro, a former leftist rebel and ex-Bogota mayor. In the second and final round of elections, Duque won 54 percent of the vote, defeating former guerrilla fighter and onetime Bogota mayor Gustavo Petro, 58, who captured about 42 percent in the runoff. 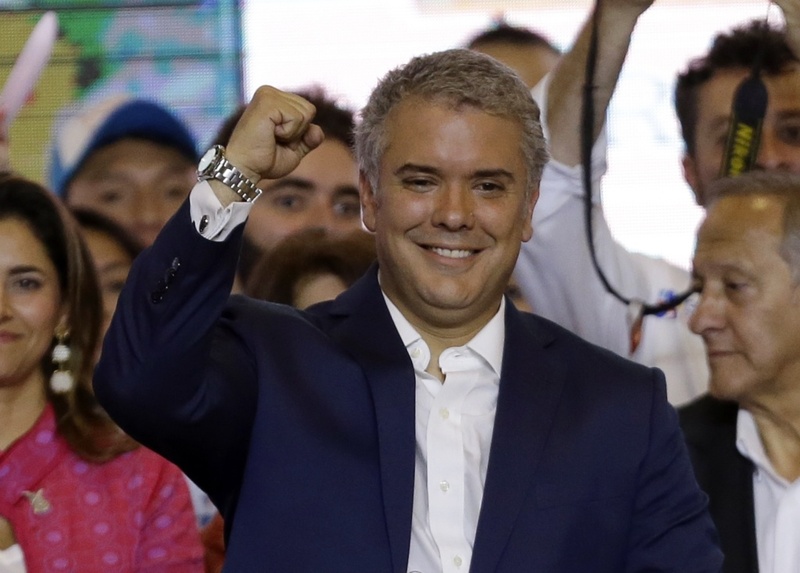 Duque's victory marks a rapid rise for the 41-year-old political newcomer who shot to popularity with the support of former Colombian President Álvaro Uribe, who, due to term limits, is blocked from seeking a third consecutive term. As NPR's Doreen McCallister previously reported, "Uribe is immensely popular for ordering devastating military attacks on Colombia's guerrilla groups during his two terms in office." Freelance journalist John Otis reported for NPR that, "Critics fear that Duque could become a kind of puppet president with Uribe pulling the strings. But Duque insists he's his own man." Otis reports that Duque has promised to boost the economy through tax cuts. Duque spent much of his career at the Inter-American Development Bank in Washington. In 2014, with the backing of Uribe, he was elected to Colombia's Senate. It's the first presidential election since the 2016 peace accord brought an end to Colombia's conflict with the country's rebel group, the Revolutionary Armed Forces of Colombia (FARC), that left more than 250,000 people dead. Colombia's fragile peace process "is considered largely irreversible," The Associated Press reports. "Most of the more than 7,000 rebels who have surrendered their weapons have started new lives as farmers, community leaders and journalists." But "Duque claims that [the accord is] too lenient on former rebel fighters," Otis has reported. "For example, those accused of war crimes can avoid prison. And Duque's supporters can't stomach the fact that the treaty has given 10 former guerrillas seats in Colombia's congress." "There will be changes," Duque declared in his victory speech. "We are going to make war victims the focal point of the peace process." But too many changes could prompt former FARC fighters to take up arms again, Arlene Tickner, an international relations professor at Rosario University in Bogota, tells Otis. "If we have a large number of ex-FARC leadership abandoning the process, it is very difficult to envision the success of the peace accords," she says. AFP reports that FARC has not contested the election, but immediately called on Duque to show "good sense" in handling the peace agreement. Gustavo Petro, meanwhile, stands by the peace agreement. In pushing for social changes, Petro has appealed to a young base with impassioned speeches. In his concession speech, Petro said "I do not feel defeated." Promising to resist changes to the agreement, according to AFP, Petro said, "Our role is not to be impotent and watch it being destroyed." Otis reports Petro's very loss was a breakthrough, "as Colombia's first leftist politician with a realistic shot at the presidency." Duque will be sworn-in as president on Aug. 7 for a four-year term.